While every supplier should strive for 100% on-time delivery, even Santa misses a rooftop every so often. Of the myriads of excuses you’re going to hear, there are three main reasons a supplier’s late. They had a production issue. Let’s review each of these and figure out countermeasures you can implement to help protect you against late suppliers. This is probably the easiest to relate to and yet the hardest to prepare for. 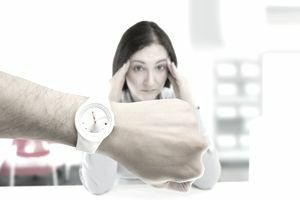 How often have you been late to a customer because one of your suppliers was late? Exactly. And what could your customers do about it? Bupkis, most likely. So how can you protect yourself against this eventuality? The easy – but more costly solution – is that you carry enough safety stock to protect yourself. The safety stock solution protects you against all three reasons that suppliers might be late but there’s the obvious financial risk of holding too much inventory. After a supplier’s late because of this reason the first time, you now have leverage over your suppliers. Use the opportunity to insist/demand that they hold safety stocks. Their safety stock policy should protect you against your late Tier II suppliers. Build it into your supply agreement. Because the cost of their component or raw material is far less than the cost of your inventory, you can even come to a financial agreement to pay for all or part of the safety stock they’re holding for you. What you can do about this issue depends on what kind of issue it is. If it’s a capacity issue – as in, they were unable to make your product because they didn’t have available production capacity – you may be able to reserve capacity ahead of time. You can do that by placing a blanket order if you know what your downstream demand is going to be. By placing a blanket order (say for six month’s or a year’s worth of supply), your suppliers can’t argue that they ran out of capacity – because they should be planning to make your stuff six months or a year in advance. If the production issue isn’t a capacity issue – but instead is some kind of technical manufacturing issue (i.e. a piece of equipment failed or a component/raw material failed), you can protect yourself with safety stock (again, held at the supplier at a lower cost). You should also be able to work with your supplier to get your product immediately back into production – and not have to deal with waiting for capacity to open up. Your supplier should eat the cost of overtime or adding manpower or other resources in cases like these. This can be the most irksome of all the reasons. Usually, if a supplier over-promises, it means that someone knew they weren’t going to be able to supply you on time. The most irksome part is that suppliers generally don’t admit to this. They’ll give you some version of one of the first two reasons instead of the truth. You may never know that they over-promised, but here are some clues. They state that a delivery will take a month and when you say “that’s too long”, they’ll tell you they can deliver in two weeks. The person who makes the promise is not involved in production but is incentivized to make the sale. The supplier has a history of over-promising and under-delivering. What can you do? First of all, you should start penalizing suppliers for late deliveries. If a supplier is habitually late, you may need to start paying 3% or 5% of 10% less than their invoices. If a supplier wants to be a good partner, that will get their attention.Finding alternate suppliers as a backup is always a good idea. When your primary supplier learns your doing this (especially if the backup is one of their competitors) that should also get their attention. But the best way to mitigate late supplier deliveries is to communicate. Communicate early – as in, give your suppliers forecasts or blanket orders so that they can secure raw materials, components, and production capacity. Communicate often – as in, check in with your supplier to make sure that they’re on schedule and they’re staying on schedule. And communicate clearly – as in, make sure your suppliers know your requirements: quantities, dock dates, and quality specifications. So, communication, planning – and making sure you have a safety stock in case Santa’s late one year.